Battle simulator — Welcome to the GameSalad forum! So i'm starting this thread for a new game i'm making. It's also a test to see how far i can push game salad (some of you might have already seen my guys in action in another thread). Firstly here is my infinitely loop-able 3d game area (though i gave it limits - as my game will need that). Looks nice, did you render out each frame ? Yep this is pre rendered, 60 frames so far. I started out with 14 frames but it was way too jumpy. I think the effect works pretty well at the moment. Now i'm starting to add the maths for my 2.5D objects to stick to the ground. I'm kicking off with footballs (sorry for the lame attempt at humour, i've got my math head on). Some strange goings on. A question. Do actors die if they go way off screen? @smurfted Yes, at 500 pixels beyond the scene borders. If you need them to stay, increase your scene size and position your camera to the middle. So after making the world a good 10000 pixels wide & getting my 2.5D code back up and running i have added my guys in this properly calculated world. It took some re-wiring but they seem happy here. In the box on the hud you can scroll the camera left or right in the world. The clanging sound is if our guys successfully get to the other side. Looks great. One thing though, the method you have for dragging the scene with the box at the bottom left gets stuck if you let go of the drag half way, i.e. if you start on the blue symbol in the box and drag your mouse half way and then go back to the blue symbol to drag again the pan doesn't work. You have to put your mouse back in to the middle of the box to be able to continue the drag. That would be fine if you had a visible slider of some sort. Cheers fella, your right about the visual aspect to the controller. I have a basic one in place but the magic of html removed it for some reason. The controls & even the game dynamic is still very much up in the air. I'm leaving as much possibilities (for game logic) as possible in how i'm setting everything up. Here is the new update, now with the ability to reap. Press the space bar & you doom a soldier to a long dirt nap. Animations will come later. But now we can at least schedule a death. The red outline box you have in place now to show what part of the scene is perfect. Much clearer now to see what needs dragging and why the drag wouldn't work when outside the box. Cool 3D effect! You inspired me to try creating a 3D effect myself. this is what I came up with. didn't spend much time on it and still a lot to improve. Just thought I would share. looking forward to see what else you come up with. Cool 3D effect! You inspired me to try creating a 3D effect myself. The car should be moving much more slowly in the distance and much quicker when near, at the moment you have it moving at the same speed wherever it is, near or far - look into the 'exp' function for correct perspective corrected speed representation. @socks Car wasn't good at all lol. how is this? Much better ! I still think the speed needs to be even slower when the car is more distant and faster when near. So while i'm busy animating my guys. 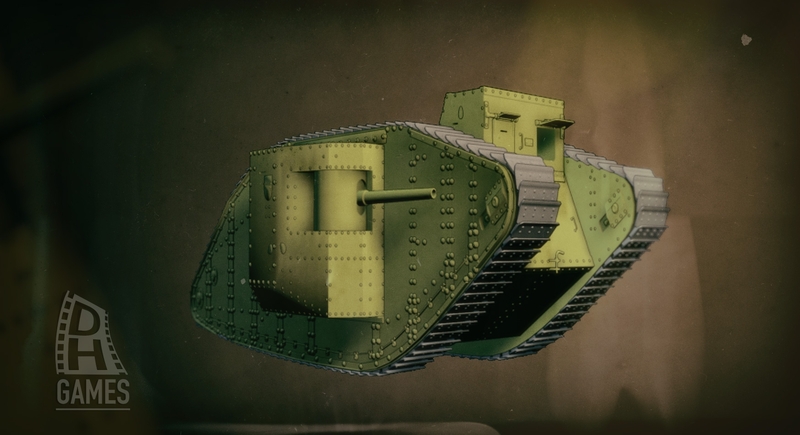 I've decided to make a ww1 tank. Not only that but i want to push out what can be done with my little 2.5D experiment (i didn't like how flat it looked i have rendered it from a few angles to get this effect). So here is my new shiny tank crossing the screen again & again (you can drag him about if you like). so after many failed prototypes i have managed to get the basic trench in & working (no game without those). It is still just a placement & mathematics test. I think you should add a little atmospheric scattering so as the scene recedes into the distance it becomes a little more blue/diffuse (the example below is a little over the top), also some shadows on the soldiers would help fix them to the ground (did a very crude 10 second Photoshop job on the image below). Okay I was with you for a while there, but I have no idea how you're getting the trench to work. It's really impressive, good work! I like your thinking socks, as the project develops & more style is needed i will defiantly keep this in mind. As for the rest i tried many ways of doing the trench, they all failed completely till this one. It took lots of clever maths (trail & error) & a completely pre-rendered trench. It cost me 3mb but it works well enough for me to continue on other aspects of the game. Next i have to try objects on the battlefield to add some more detail (& to check if the game still runs respectably on mobile devices). Rather than just charging forward (excuse the pun) i'm going slowly, trying to keep in mind the playability in the game so I've added a little control bottom left so you can have your troops hold at a trench. I'm trying to keep the thought process as simple as possible for the guys as there are so many of them it will drastically take an effect on the processor..
the logic is pretty clean at the moment but trying to add multiple trenches might upset the speed of my guys thinking. I'm thinking a table reference that loops but it even sounds heavy.. Adding a little more "game" i have added a button that calls roughly 5 troops.